Thanks heavens for Mrs Favell Lee Mortimer for, without the things that today make the world an easier place to know, she managed to tell the people of the mid nineteenth century all they needed to know about life as it is lived in all four corners of the world. Over three volumes, Mrs Mortimer provided a succinct, if blunt, guide to the peoples of Europe, Asia, Australia, the Americas and Africa. Those three volumes have been condensed into the single book reviewed here. Mrs Mortimer continues in similar vein making her outraged pronouncements, pontificating on the rights and wrongs of the customs and preferences of people from every country. Nobody escapes her harsh tongue and even when the odd back-handed compliment seems on the horizon, she always manages to find some reason to negate it. The book is written in the ‘second person presumptive’ and sounds like a teacher instructing a class of very stupid pupils: Mrs Mortimer asks lots of questions of her readers and then immediately answers them herself. She also likes to describe something in detail – a custom or a food item particular to one country – and then tell the reader that they wouldn’t care for it. Mrs Mortimer certainly believes she knows best – and from her fearsome tone I suspect few would want to argue with her. For once Mrs Mortimer was correct: I drank kwas in Armenia and threw up an hour later. What comes through most is Mrs Mortimer’s strong sense of morality which is not limited only to religious values although her strong faith certainly plays a major part in defining her opinions. Catholics bear the brunt of her disgust with Muslims running close behind. Now, I am opinionated; you, my friends are too, that’s why you come here to read these reviews. But Mrs Mortimer is perhaps more opinionated than most. Indeed the book is subtitled “Mrs Mortimer’s Bad-tempered Guide to the Victorian World” and few could argue that she exercises any caution or ‘political correctness’ in giving her opinions. But the truth is that this fiery lady travelled outside of England only twice in her life. The first time as a teenager when she visited Paris and Brussels with her family, the second time just AFTER the publication of these volumes to Edinburgh. At one point she lived in Shropshire just a few miles from the border with Wales but she still formed her opinions of the Welsh without ever setting foot in that country. In fact, she formed her opinions by reading and researching as much as she could from books, journals and newspaper accounts. Many of the books were fictionalised account themselves by people who had as much real knowledge as she did herself. 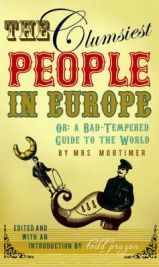 What makes reading “The Clumsiest People in Europe” even more fun is to know a little about her background and in this volume Todd Pruzan gives an excellent biography of Mrs Mortimer though I will only mention the key details here for this part of the book is almost as enjoyable as Mrs Mortimer’s tirades. She was born in 1802 and her father was one of the founders of Barclay’s Bank. She was raised a Quaker but as a young woman she met a young man, Henry manning with whom she formed a strong friendship. Together they explored the bible and she converted with Henry’s encouragement to Evangelicalism. When she was thirty years old her mother forbade her from marrying Henry, who later married the daughter of a rector. Henry’s wife died after only four years of marriage and he entered the clergy. Meanwhile at the rather advanced age of 39 she married the Reverend Thomas Mortimer who turned out to be a cruel and callous husband. They moved to Shropshire but she spent most of her time at her brother’s house trying to avoid Thomas. Thomas died in 1850 and the following year Favell received some terrible news: Thomas had converted to Catholicism. Nothing could have wounded Favell more than this. In all Favell wrote sixteen books, some more popular than others. The most successful were known as the “Peep of Day” series intended as religious education for the young. In fact the full title was “A Series of the Earliest Religious Instruction the Infant Mind is Capable of Receiving”. In it were the first examples of the overbearing didactic tone she would use later in her volumes on the peoples of the world. I expect there were few children who went to a Sunday School where these books were used who were not terrified into holiness! How should we regard Mrs Mortimer today? Of course, there was not the political correctness that permeates our laws today so Mrs Mortimer wouldn’t have thought twice about the possible repercussions from her books. Maybe she thought she was being genuinely helpful and educating those who needed it? Certainly she does give the impression that she is somehow “saving” people from the terrors of travelling by kindly providing you with all you need to know. What is disappointing is that Mrs Mortimer pays no attention to the current affairs of the day. Her volumes were written during a time when Europe, and indeed Africa as the European powers were scrambling to colonise, was in great turmoil with war raging across the continent but Favell doesn’t make any mention of it at all. This is a perfect book for dipping into at random. It’s a real laugh-out-loud book that in turns has you cringing then hooting. Thoroughly recommended as one of the (unintentionally) funniest books I have ever read! “It is a rare thing in Egypt to speak the truth. There was an Egyptian, by trade a jeweller, who was a man of his word. His countrymen were so much surprised to find he spoke the truth constantly, that they gave him the name of “The Englishman”. No Comments on "The Clumsiest People in Europe"